That was my training on the first day of this mapping job. Training by fire. Sitting in the cab of “Buck” with 8 or 9 maps (All 4 feet by 4 feet so they are all folded many times over), a ruler and a GPS I was reading the Latitude and Longitude and then calculating our exact position within 5 or 10 feet. We were looking for trails that were either seen from detailed aerial photos, historical records or maybe even just a hunch from someone at the GVT. At least, that’s what I was SUPPOSED to be doing. I was trying, but in all of my offroading and exploring it was never so critical to TRULY know where you are, exactly. I only needed to know about where I was and where the next major turn was. I needed to get on top of this skill, and fast. I needed this job, I wanted this job, but most of all I wanted to be a part of this ragtag group of yahoo’s that I came to know as the Rat Patrol. Over time we got to where we’d spot a trail because the brush was about 2 inches shorter in 2 spots, but only if you looked at it straight on. That would be from the 2 slight depressions from prior vehicles traveling a now, rarely, used track. By the way, that jerk Dennis, became a reverend just so he could do me the honor of marrying me and my wife last month. It all worked out in the end. So, during and just after WWII the country was in a frenzy to find enough Uranium to enrich. So, there are spots in the remote bits of the US where we found it. One of these spots were along some trails we had to map today. The Forest Service guys said, “you should be fin as long as you don’t stay to long or start eating the dirt.” Right... I used to think a guy in uniform might know what he’s talking about, but doing this job I learned that it wasn’t so, many many times over. So, as we were riding around the area logging trails we came to a pretty good hill. Nothing steeper than I’d ridden most days, but it was filled with softball sized rocks. About half way up the tire just slipped and spun. Next thing I knew I was pushing my bike with the rear tire spinning and throwing a ton of dust in the air... You know what they build the roads to mines with? All of the rock or “tailings” they remove from the mine. Oh good, I’m breathing a lot of Uranium dust. On the plus side, I glow like a safety beacon in the dark. We rode past one of the mine openings. It was interesting to note that a lot of people had camped right here or even explored the mine. Stupid is as stupid does, but who was I to talk at the moment. This opening was about the width and height of a bus. More openings, that although blocked off at one time, had been reopened by crazy and curious visitors. Enough of this! Let’s get out of here and never come back. We rode up, and up and up until we were at about 8,500 feet. Not a bad lunch spot. It even had a porta jon! Although, I didn’t feel like getting a black widow bite so I only used it as a kick stand. More great signs! This one was down a trail where the grass was several feet high. 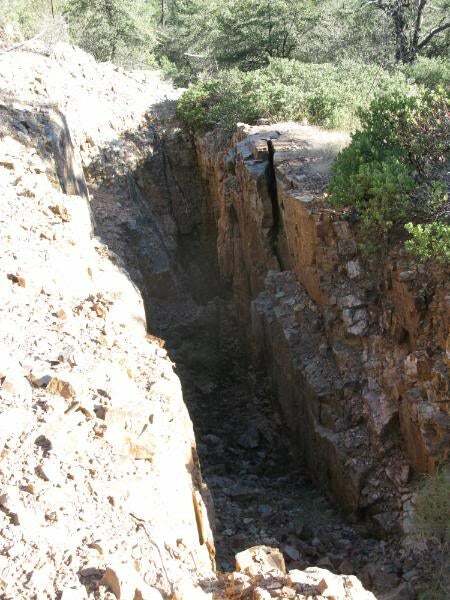 It’s an old road that likely sees a “couple” of vehicles a year that leads to an old mine. The higher the grass on a road, the more excited I get because that means less people have been there before me. Old ore cart tracks and head frame were scattered about. It would be... bad, to ride this area at night. The trail came up from the right in this shot. The wedge cut out of the ground had a shaft right in the middle that went, who knows, how deep. Leaving “home”, nice and cold each morning. Fire lookout tours are a change to get some elevation and see your surroundings. It’s also often a chance to chat with someone who’s bored out of his mind and looking to talk to someone! RECORD SCREECHING!.... Time to move! We’re going back to Wikieup! Where it can be 100F in town and still have snow on the Hualapai’s next to town. The snow would come and go as you rode. Over a pass it might be so deep that the bike was overheating as so were you, while pushing the bike inch by inch. There was a lot of old mining history to look at though. A great place to camp is buy an old chimney. If it’s solid enough you can still use it for your campfire. Looks like neat old stone house! Let’s check it out! What could go wrong? If you ever see this, turn around and leave, quickly. Bleach is used in the production of meth. Too bad because it was a decent looking building. Sections of trail like this were great. We’d just passed a boulder the size of a car so this section hadn’t seen any four wheeled vehicles in a while. I’d started using an Ogio flight vest in place of a backpack. I still use it today. So much nicer to carry weight evenly instead of just on your back. Clint road a bike we affectionately named Porky. An XR600R that he rode like it was a feather-lite bike, which it was anything, but! Sometimes, you’d spend a while working on climbing one hill. Just to find a dead end, but at least it was recorded in and done. One day, we’d fought through snow for hours on end. It started out harmless enough. Just a slick hill where the snow had turned to ice. Progress was slow. Lots of tire spinning. Pushing the bike for sections. You and the bike would overheat and then if you rested for a minute you’d start getting cold, fast! We found a dry spot to stop for lunch. Then it was back at it. Slow progress. Deeper still. The best technique was treating it like deep sand. Start in second gear and keep moving at all costs until you lost all forward momentum. Then, whatever you do, don’t dig a hole with the rear tire. Sometimes following the tracks of the other guy helped, but mostly, fresh tracks seemed to be the safest and easiest. The tire in front of you would polish the snow into a slicker ice. Sure, it doesn’t look deep, but it was enough to hold the bike up without a kick stand. This is my, cautiously optimistic, face. Happy to have made it here, but picturing going down steep snow trails somehow didn’t offer much comfort. Feeling wet with a combination of cold melted snow and sweat, it was easy to get frustrated, but then it would hit you, I COULD BE IN AN OFFICE RIGHT NOW! Thank god I wasn’t!! Being the westward face of the mountains, there was only a little snow in shadowy sections. We were happy for that! The downhill ride was uneventful and fun. We saw some old ranches on our way back into some warm territory. Desert, sweet desert, how I love thee. The sun was warming us up and it was wonderful. So... we’d made it over the pass and logged in the trail we need to get done, but we ended up on the wrong side of a fairly large mountain range from home. Even with large desert tanks we didn’t have enough fuel to make it back to town. Hmmm. Well, let’s just keep going west and see if we can bum some gas at the highway. These guys weren’t very talkative. The one gas station we found had been closed for 6 months. The house next to the station had a sign that said NO FUEL FOR SALE. We decided to try anyway. We weren’t some station wagon from the highway that just planned poorly, we’d come over the mountains and the next gas was 30 miles which in dirt bike terms was TOO FAR to make with what we had left. We hoped he’d feel the same way and take pity on us! Thankfully, the guy eventually obliged and charged us the most expensive gasoline we’d ever bought. Let’s hit the graded sand highway back around the mountains and get HOME!!! Next time, we head to California. Building a home made snorkel. Cheesy or custom? 2010 5th gen 4runner Trail Edition Icon Install and Chiva Falls break in.